From the Temple Church, London, tenor James Gilchrist and pianist Anna Tilbrook perform a celebrated version of Schubert's song cycle Winterreise, about a poet's winter journey. Continuing a week of concerts from one of London's most historic and atmospheric churches, tenor James Gilchrist and pianist Anna Tilbrook perform their acclaimed interpretation of Schubert's song cycle 'Winterreise'. Schubert's Winterreise, depicting a poet's winter's journey, perfectly captures the cold and darkness of this time of year. The cycle of 24 songs based on poems by Schubert's favourite song-poet Wilhelm Muller, shocked the composer's friends at the time with its bleak sentiments and sounds - yet Schubert insisted that Winterreise was as good as anything he'd written, and time has proved him right. James Gilchrist trained as a doctor before turning to music, and he is celebrated for his individual approach and imaginative programming. His recording of Winterreise with Anna Tilbrook was CD of the Month in BBC Music Magazine, Editor's Choice in Classical Music Magazine and Album of the Week in the Independent. 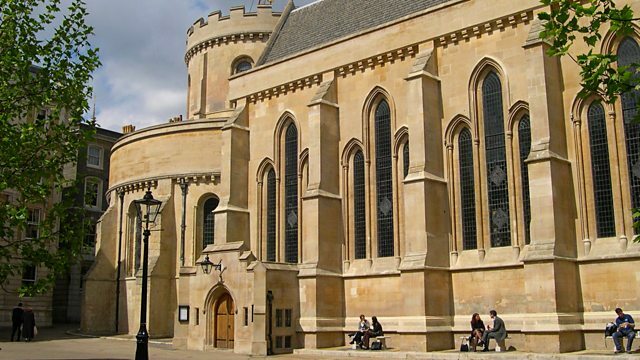 Following the concert, the Reverend Robin Griffith-Jones, Master of The Temple, tells more of the story of the Temple Church, in conversation with Sara Mohr-Pietsch. The Temple Winter Festival series of concerts is promoted by BBC Radio 3 in association with the Temple Church and Hazard Chase.